Operating data/digi modes can be fun – Often, a that elusive contact can only be made on a mode like CW or digital where the signal carries further than voice. One of the popular modes is PSK and in order to send/receive it, you’ll need to connect your radio to your computer’s soundcard. Some of the newer radios offer a USB socket on the rear which includes CAT control and an audio device, so the hard work may have already been done for you! However, if you’ve got an older radio, perhaps something “previously enjoyed” as your first dabble onto HF, you’ll find that most radios have a “data” connector at the rear – this is typically a 6pin mini-DIN socket (just like a PS/2 keyboard connector) and offers a fixed-level RX audio, TX audio and PTT – The advantage of using this connector is that you can then use the AF/volume control without affecting the audio going into your computer – Useful if you wish to decode something but not be distracted by the warbling tones! 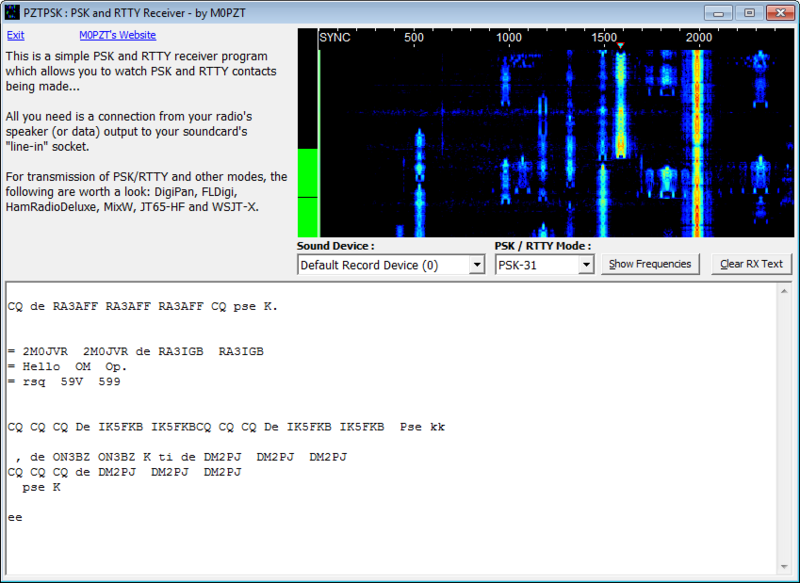 If you wish to try receiving PSK (or RTTY, JT65 modes) without a special interface – you can try connecting the headphone output of the radio to your computer’s line-input. Some careful adjustment of the volume on the radio and the line-in record level will be required. If you set your line-input to “play through” via Control Panel, you can still monitor the radio via your PC speakers. 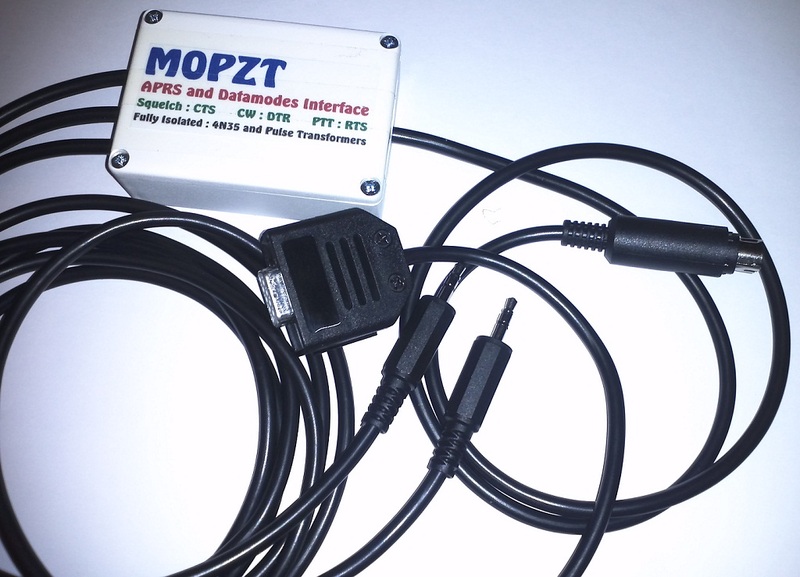 These interfaces can be used with modes like PSK, RTTY, JT65, SSTV, APRS and even to play/record audio (eg: contest voice-keyer) files. Software-wise, a good place to start is with a simple receiver application – Good job that I’ve written one, then! 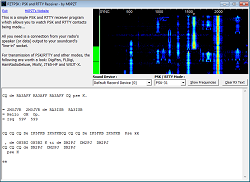 EssexPSK is a simple PSK/RTTY receiver that’s available via the EssexHam website EssexPSK is designed to give newcomers to datamodes an easy method of decoding signals from the various PSK+RTTY speeds. A great deal can be learnt simply by listening to these modes: The sort of QSOs that take place, the wide range of people using it, not-to-mention the odd bit of DX that springs-up! It can also serve as a quick way of trying PSK without too much setting-up and for RX-only, you can use the speaker output of of the radio for a quick and dirty way of getting it working. The EssexPSK app has had publicity in the Southgate News site as well as the ICQ Podcast S06E24 (16mins in). 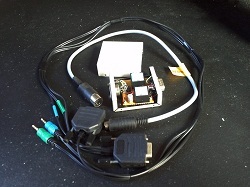 In the UK, G4ZLP and RadioArena sell a pre-made USB opto-isolated interface for around £25-30. These are the quickest ways to get active, especially if you’re not feeling brave with a soldering iron! 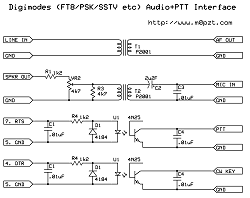 The other issue preventing home-brew construction is the lack of real COM/serial ports – The RTS pin can be switched “high” (+v) by your datamode software when it wants to transmit, and this in turn would switch a transistor or opto-coupler allowing the PTT line to connect to ground. As most computers are USB, you will either need to buy a ready-made USB interface or build the following interface and add a USB/Serial converter (these are readily available on Amazon) for about £5-15. Some radios, such as the FT-450D, FT-857D, FT-897D, FT-950 all offer a “Digi-VOX” mode allowing the radio to be keyed upon detecting audio coming into the data socket. 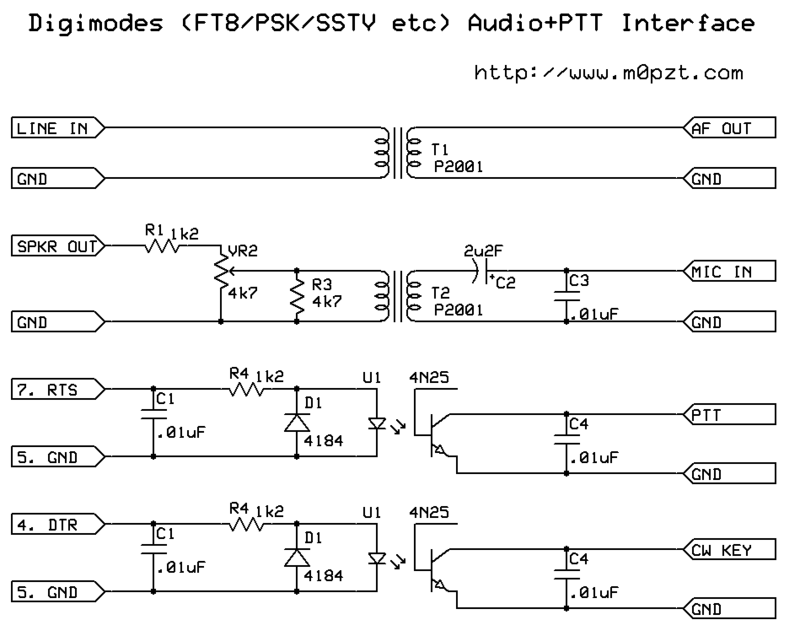 This makes the PTT interface somewhat easier – As simple as a 6pin mini-DIN to 2x 3.5mm plugs to your soundcard. Some people completely omit the isolation transformers – YMMV. As of December 2015, I’m using a newly-built interface. 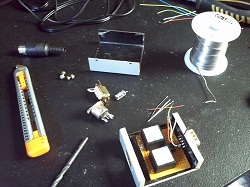 Using a simple white ABS box from CPC and some 4-core+screen cable, it houses a pair of audio isolation transformers and 3 4N35 opto-couplers which fully isolate the radio from the computer. Not shown in this picture is the CW hookup which plugs into the “Key” jack on my radio. The 9pin D connector is a “real” serial port interface and the 2x 3.5mm plugs go to my soundcard. 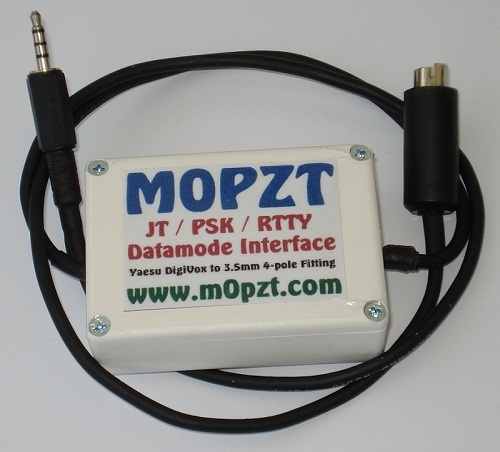 There’s a 6pin mini-DIN for the back of the radio and the whole ensemble can be used in many modes such as PSK, RTTY, JT65, SSTV and even AX25/APRS via the AGW Packet Engine. A word of caution if you’re planning to use the CD/CTS line for squelch/COS from the radio: On most Yaesus, this is usually +5v when the squelch is open (or valid CTCSS is detected) – If you connect this direct to your serial port, your radio’s speaker will most-likely mute. The circuit below was my original interface, built in 2009 and offers complete isolation between radio and PC – Parts are available from CPC or Maplin. 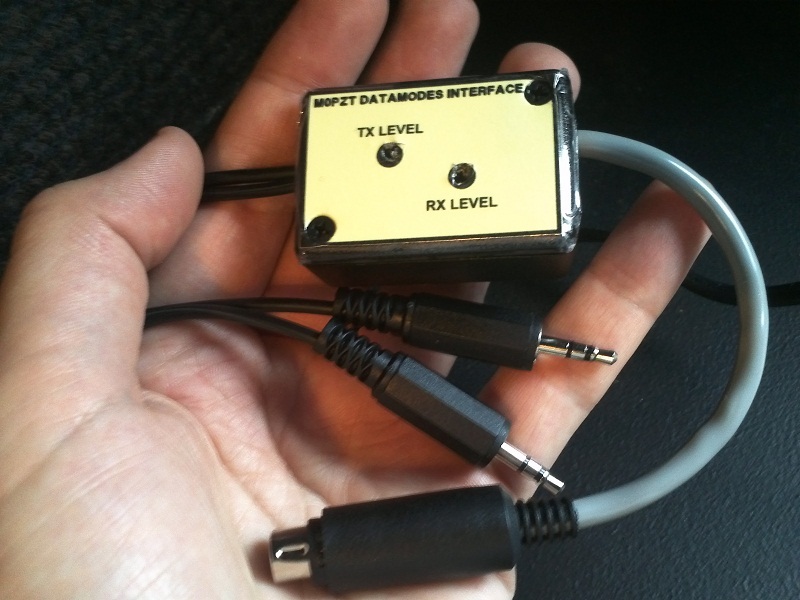 A simple project box finishes-off the interface – I used an old HamComm/JVFax interface that I had in my “junkbox” since the mid-90s (yes, I keep a lot of old tat!). The circuit diagram below was originally drawn in 2006 and although my recent interface varies slightly, the basic concept is the same – There are many other examples of this circuit available online. Even with modern USB computers, home-brewing this sort of circuit is still possible if you make use of a USB/Serial adapter – It creates a virtual COM port on your machine that many Ham Radio apps can use to control the PTT. Back in April 2013 I built a very basic “passive” interface with no Opto/PTT control – The idea being that it would work with any radio that supports “Data VOX” – This includes a number of Yaesu radios (including my FT-857). This allows you to get onto datamodes without having to worry about RS232/USB convertors and drivers. The radio takes care of the PTT. In June 2015 I bought a new laptop that had 4-pole 3.5mm “combo” socket rather than a pair of 3.5mm audio connectors. Rather than use a Y-splitter, I made a new interface using my last pair of ETAL P2001 transformers and some nice 4-pole plugs that I now stock in my Ham Goodies store. I housed it in a simple white ABS enclosure from CPC and used adhesive-heat-shrink on the cables to remove the need for any additional box-mounted connectors.